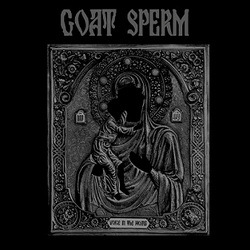 Hailing from Ukraine, GOAT SPERM are a shadowy power-trio who play orthodox black/death metal exclusively. Theirs is a world-eating sound drawing equal influence from the realms of sepulchral death and morbid black, billowing obsidian smoke and weaving an almost ceremonial aspect, all whilst maintaining an intensely martial surge. Unremittingly physical and yet suffused with an atmosphere that's paradoxically wide-open and chokingly claustrophobic, Voice in the Womb is aptly titled: within its three-song/19-minute foundation lay myriad catacombs to get lost amongst, deeper mysteries at each turn to unravel. Witness the fullness of GOAT SPERM's coming, and hereby obey the Voice in the Womb.